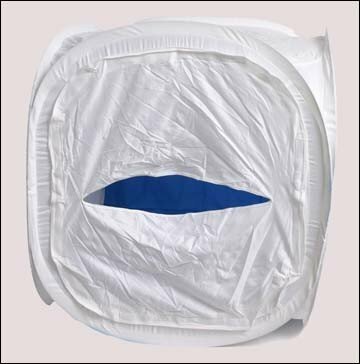 These tents are supplied with both a carry pouch and and interior blue background. Easy to set up...just "pops" into position. Flatten, twist, and fold to reinsert in zippered storage pouch. Great for all reflective objects: glass, coins, silver, gold, etc. Creates a really nice soft lighting effect without glare or reflections. Creates a really nice soft lighting effect without glare or reflections. Easy to set up...just "pops" into position. 48 inch X 48 inch X 48 inch. Great for larger items. If you have any questions about this product by RPS, contact us by completing and submitting the form below. If you are looking for a specif part number, please include it with your message.